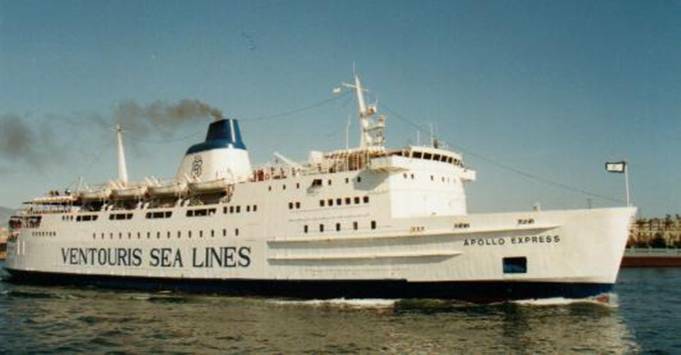 Apollo is a classic name for a cinema, but our mission is to be unique and the choice of this name, although obvious, is perfect: Cinema Apollo Express, a familiar name to anyone who loves the ferries of Aegean Sea! Here you’ll find all the movies made with my digital camera in 2005 (there are amatorial, so sorry for the quality!!! ); you can find them on .zip format and you’ll need for some of these of the Quick Time viewer, which is downloadable here ; some others are enjoyable with Windows Media Player. New videos will be marked. Well, if the pop corn are ready enjoy the vision! Thanks to Alessandro Orfanu’ for his precious help. Si sa, che un cinema si chiami Apollo è un classico, ma ovviamente bisogna distinguersi e l’idea, per quanto ovvia, è indiscutibile: il nostro si chiamerà cinema Apollo Express, nome familiare a chi ama il Mar Egeo. Qua troverete tutti i video ripresi con la digitale nel 2005; li trovate compressi in formato .zip e per vederli necessitate per alcuni del visualizzatore Quick Time (meglio la versione 6.5) che potrete scaricare qui , altrimenti basta Windows Media Player. I nuovi video saranno evidenziati. Beh, se i pop corn sono pronti buona visione!!! Ringrazio Alessandro Orfanu’ per la preziosa collaborazione.